This is the largest of the spheres we saw in the park. Jeff and a sweet stray we met are hanging out in the background. I was a tad disappointed that there are no major archeological sites in Costa Rica. No pyramids. No sprawling vestiges of ancient empires. But they do have one thing going for them. They’ve got balls. Or spheres, more accurately. Apparently, around 1,000 CE or so, indigenous people here were carving stone spheres. Archeaologies are sure exactly what they were up to, but theories range from them being some sort of Stonehenge-like astronomical clock to religious artifacts. I definitely made a note to get to the museum to see them. 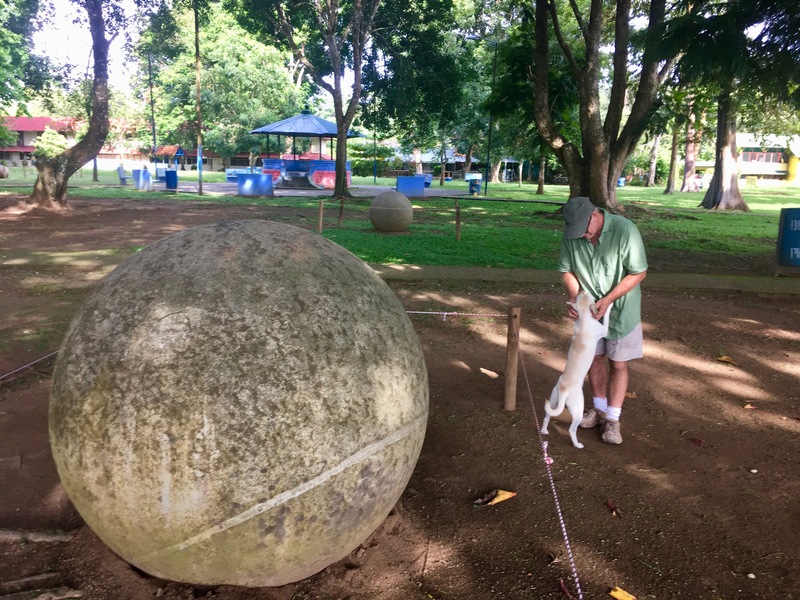 One of the stone spheres sits in the park with neighborhood in the background. After lunch on Thursday Jeff and I drove south to Cortez, where Jeff had to pay his Costa Rica property taxes. 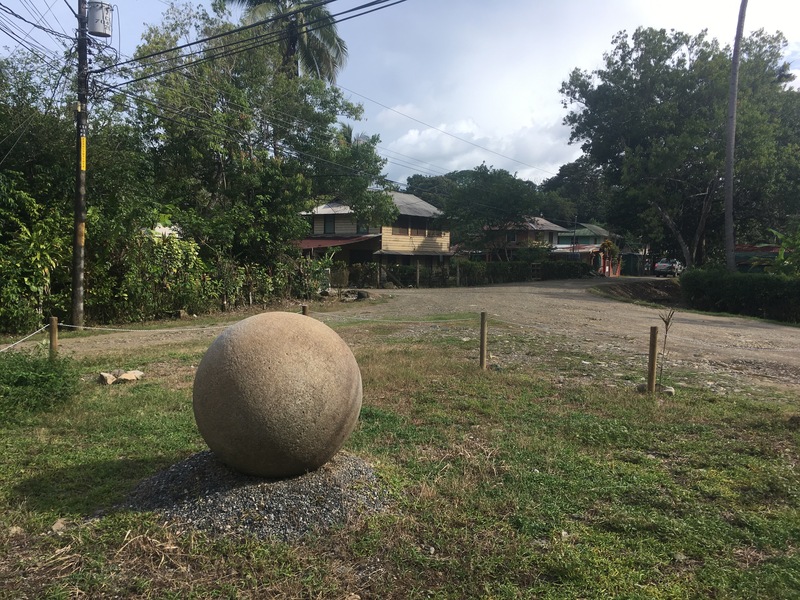 After paying homage to Mr. Taxman, Jeff headed toward Palmar Sur, where the museum for the pre-Columbian stone spheres is located so I’d know how to get there. We didn’t intend to go to the museum. 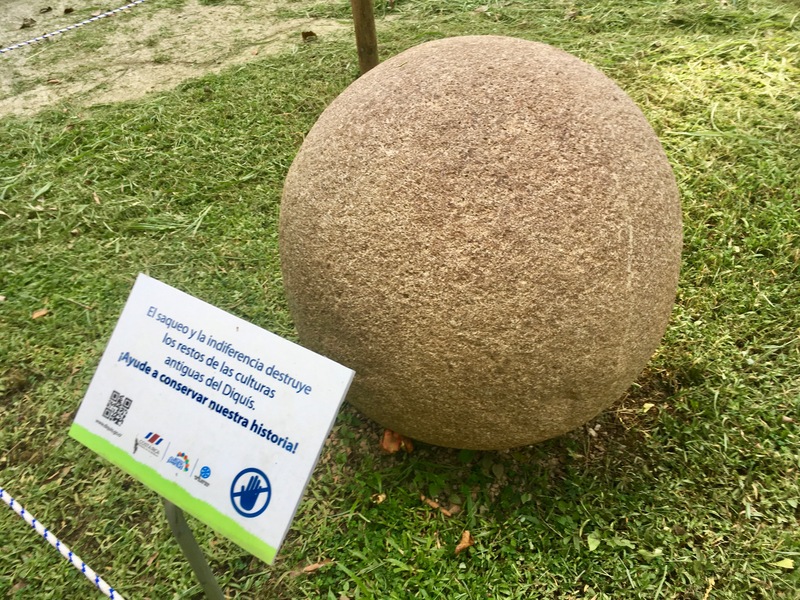 But along the way, we passed a humble park on the side of the road where stone spheres were strewn around. We stopped to check it out. It was clear this is for Costa Ricans, urging them to understand and celebrate their pre-Columbian heritage. From there, we headed west, back toward Uvita, stopping in Ojochal for a few beers at the Bamboo Room, which is run by a couple from Toronto. It’s a cool music venue perched atop a precarious driveway with great views of the Pacific. We talk to the owner for a while, who pauses periodically to clean gecko poop from the ceiling (a task every Costa Rican business owner is familiar with). 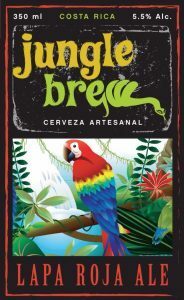 We had a few Costa Rican microbrews from Jungle Brew, including an excellent Lapa Roja Ale (Red Macaw Ale) and a Congo Black Lager. We then continued on to another place perched atop the ocean for dinner. I had a National Especial and pasta with seafood. 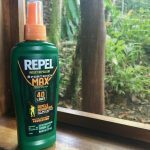 When a friend visited Costa Rica a few years ago, he came back very impressed/humbled by the fact that there are lots of things here that can put an end to you, ranging from ornery vipers to toxic spiders. I get a taste of that when I walk into the bar area and Oscar, who is one of the Ticos working on Jeff’s place, is using a broom handle to end the life of a spider while keeping a safe distance. I couldn’t glean what type of spider it was, but apparently they’re very toxic and like to jump at you. Oscar said if you get bit by one, get to an emergency room for a shot of anti-venom. It’s not the most toxic of spiders, but it’s also not something to be trifled with. It looked a bit like a dried up piece of palm frond so it was nicely camouflaged for the task at hand. Oscar wasn’t fooled, however, and dispatched the venomous arachnid with extreme prejudice. A small part of my Deet arsenal. Oscar loves the flora and fauna of his homeland and was quick to call our attention to some sort of white raptor that soared overhead (happened too quickly for me to see it in enough detail to attempt an ID in the Birds of Costa Rica book). He also plucks one of the numerous pineapples Jeff has planted on the property, saying it’s ready to eat “ahoy.” It was golden and delicious. 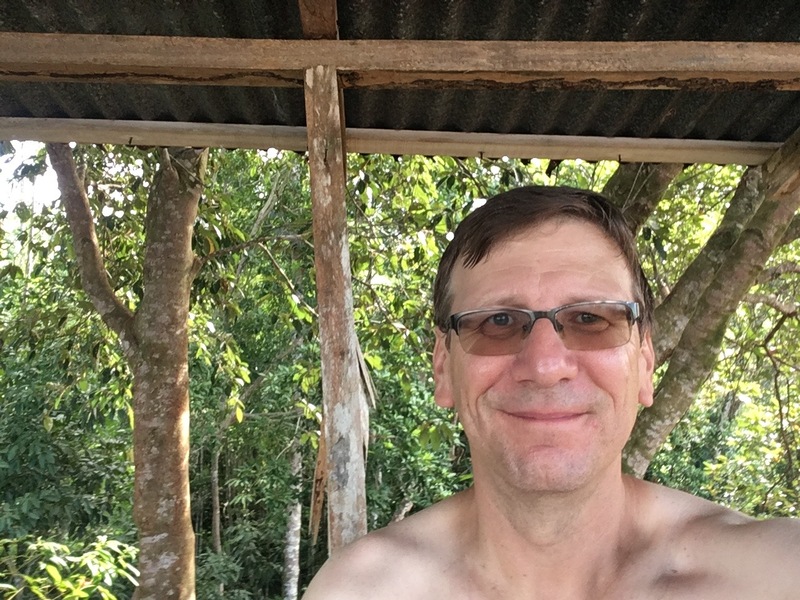 Jeff and I are sitting in the kitchen area, taking politics, music, and Costa Rica tips while a steady rain beats down on the metal roof overhead. Suddenly, we look at each other. Then the ground. Then back at each other . The cement floor undulates beneath us for about 5 or 10 seconds. Without a word, we both get up and head out into the parking lot, away from the building. It’s a solid concrete structure reinforced with rebar, but we’re not taking chances. When it’s clear it’s over, we’re incredulous. I’d experienced a 5.8 earthquake in D.C. in 2011 that damaged both the National Cathedral and the Washington Monument. This was the same feeling today, though not as long or hard. Definitely a temblor. That braying I’m hearing every morning around 5? The sound of what I thought was a distant, pissed-off donkey. We also ran by a liquor story because I’ve been craving a rum and Coke. I grabbed a bottle of Flor de Caña, a really nice Nicaraguan rum that apparently is now owned by Ron Rico. While there, I was relieved to see that Spanish speakers stumble in their attempts at English in ways more amusing that my mangling of Spanish. Care for a nice single molt? Jeff has done a great job thinking about the grounds and how to organize the flora. Every time he eats a pineapple, he cuts off the top and plants it. And they sprout. He’s done this dozens of times and they all take. 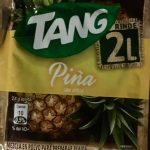 Pineapple knows how to thrive in the jungle. The property also features an assortment of other fruit trees that are trying to weather the assault of leaf-cutter ants. 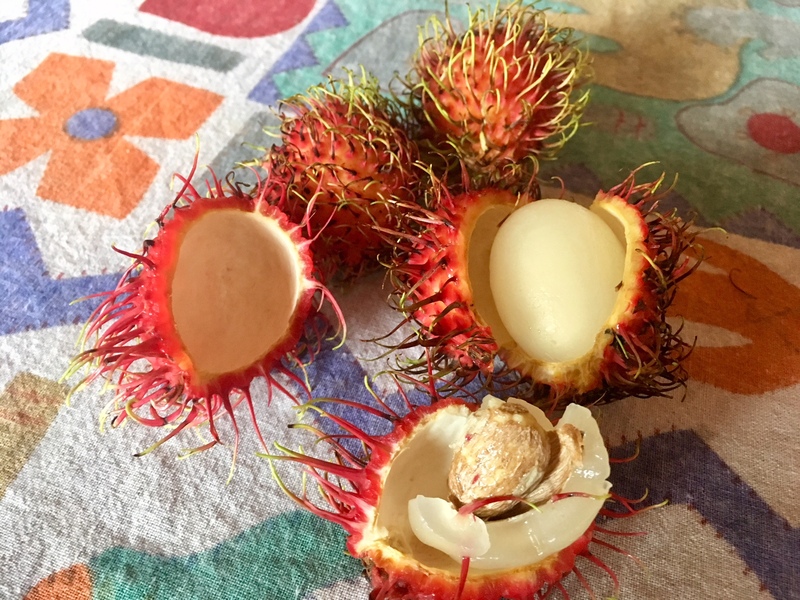 Jeff cuts a branch of ripe rambutans from the tree, and we sit there like a pair of howler monkeys stuffing ourselves with the delicious fruit. Tang. Nectar of astronauts. And Jeff. From here, I have a magnificent view of the Pacific, including the Whale’s Tail of Uvita, which at high tide renders as a line of breakers off the coast. As low tide approaches, a sandbar emerges that looks like a whale’s tail from above. It seems quite appropriate for Ballena (whale, in Spanish) National Park. I’ve already watched a trio of green parrots soar over and disappear in the canopy below. They were to quick for a more complete idea. Yellow flycatchers are darting through the leaves of a tree down the mountain that’s at eye level from where I sit. The fears and stomach acid that I wasted time on before coming here have largely been for naught. I’m a bit worried about how I’ll manage without a car, but I’m going to give a shot for a week or two to see how it goes. Play Colonia, which is part of the national park, is definitely walking distance from here, as are a few restaurants and a not-so-super market. I’m planning to go minimalist with food, focusing one a largely veg, fruit and fish diet. It’s working really well so far. My appetite has been modest, and the jungle-ripened fruit is incredible. Yesterday, Jeff made one last attempt to acclimate me to my new environs. He’s been fantastic on that front, driving me around and pointing out key things so rapidly it was impossible to digest it all. So he also left me with a hand-drawn map and several pages of auxiliary info, including contact details for Gian and Sara, whom I met yesterday. Sara was at the Saturday market selling bread (herb focaccia for me; pizza for Jeff). Great stuff. She’s Italian, as is her partner, Gian. They stopped over last night for a few beers and I enjoyed their company immensely. Good people. Gian’s family immigrated from Italy to … Uniontown, Pa., and then Pittsburgh, my hometown. 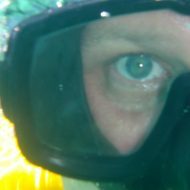 As we talked and swapped stories, it also emerged that Gian spent time in Destin as a kid and knows Seaside and Seagrove, two areas I was very familiar with when I was the news editor of the Destin Log back in the mid-‘80s. He’s a bit jaded about the Uvita area, noting that before the paved road came in here 10 or so years ago it was exceedingly remote, accessible only by boat or horseback. 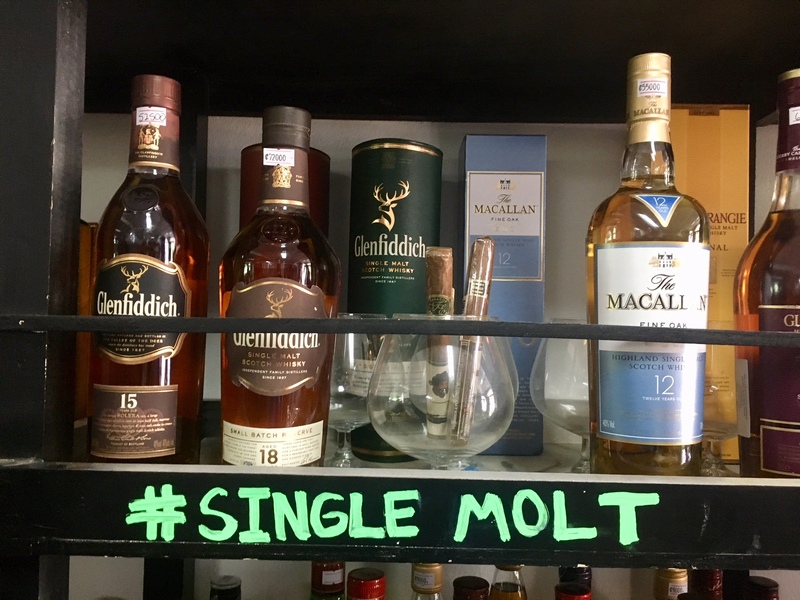 As a result, the folks here are more insular than other Costa Ricans, who have had decades to come to grips with the pros and cons of tourism. There’s apparently resentment against Gringos here (defined pretty much as anyone who “ain’t from ‘round here,” as my friends in Tennessee used to say. I haven’t experienced any hostility or passive aggressiveness from the local Ticos, as Costa Ricans are known, but it’s been a short time and I’m dealing mostly with the folks who have figured out how to profit from tourism. As an example, I tried to give a woman at the farmers market 5,000 Colónes (about 10 bucks) for a small bag of organic carrots after she asked for “cinco.” She laughed, pulled out a calculator and showed me it was 500 Colónes (about a buck) and handed me change. Gian says he and Sara decided to land here after checking out other parts of Costa Rica largely because it’s so damned beautiful and it was clear after the highway came in that this area would be a good bet. As Gian and Sara departed last night, Gian made it clear that if I needed anything I should call. And I believe he was sincere about that. It’s comforting to know I can get ahold of someone who is fluent in English and Spanish (and Italian) should I need it. I hope to see them often over the next few months. We stopped at Fuego Brew Co., a beautify building where we had a Milagro Espresso porter that was amazingly good. The structure featured bamboo railings that were as thick around as my thigh, harkening back to an earlier trip Jeff and I took to a nearby bamboo forest that reminded me of Jamaica’s Bamboo Avenue. Apparently a woman who arrived in the area before most of the development did started planting bamboo. Now she’s made a business of selling the bamboo for these types of uses. The beach at Domincal was a bit underwhelming, very rocky, which apparently is the result of a recent hurricane that left it strewn with rocks and rubble. But the waves are incredible and I definitely could see the appeal to surfers. I’ve never tried surfing, and not sure if I will while here. It doesn’t look like something I’d excel at … or even be competent at. 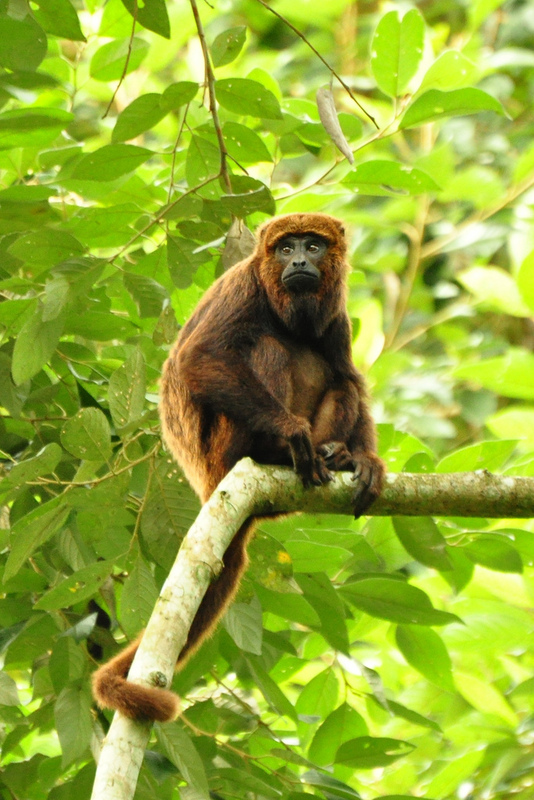 As Jeff, Gian, Sara and I drank beer and talked about Uvita last night, we saw a howler monkey move into the trees on the property, followed by other members of his group. So I wasn’t startled at 5 a.m. when the howlers made their presence known. First there was a distant, guttural grunting that I’d mistaken for donkeys on my first morning in Uvita. It was from another group of howlers out in the jungle, and it soon drew a response from our group. I stood on the deck of the Treehouse listening to them for an hour as the sun came up. It was an astounding experience. I could hear them dropping fruits and whatever else they were eating throughout the night, some of which clinked off the metal roof of the Treehouse as I lay in bed. Their howling made me think of Allen Ginsburg and his primordial scream of a poem, Howl. The Beats were certainly no strangers to monkey business. This is a fabulous Bob! So many things you mentioned that reminded me of living in Nicaragua. Lime tress growing in the backyard, replanting pineapple tops and eating mounds of rambutans that I know as mamon chinos. I’ve never seen them in their natural habitat though, always bought them from a street vendor or at a mercado. We just might make it over to you. Not as expensive as flying home. The obstacle will be Emma’s schedule. She was accepted into UNAM’s veterinarian program and it appears pretty intense. I will talk with her tonight to see if there are any free days coming up. Perhaps in September during the Fiestas Patrias. I was guessing the flight from Mexico City would be reasonable. Would love to see you guys if you can work it out. The only bad week would be that one in October where I’m returning to the States on business. Other than that, sooner is better since the teeth of the rainy season apparently comes in October/November.